A new haven for wildlife is taking shape right in the middle of one of the UK’s biggest industrial estates. The Village Bakery have spent £25,000 on creating two new ponds at the six-acre nature reserve at Erlas Black Wood. The site is next door to the family firm’s two bakeries on Wrexham Industrial Estate and will become an amenity for staff and members of the public when it’s finished. The company has been working with the North Wales Wildlife Trust and environmental specialists Enfys Ecology to create and manage the habitat for the newts. 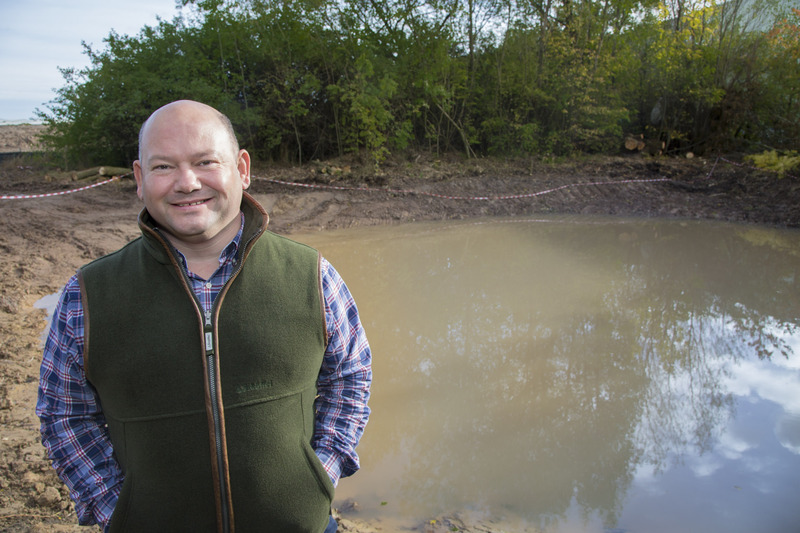 Projects director Christien Jones said: “We’ve created two new ponds to add to one that was there already. “One of them is 40 metres by 20 metres, another them is 10 metres squared and the third one is about 30 metres by 20 metres. “They’re substantial ponds but they’ve been designed by Enfys Ecology to have certain depths, to have some newt habitat. “The habitats come in various forms, from piles of logs, decaying logs, to piles of used brick. “The newts like long grass and undisturbed felled trees so we’ve cleared a few trees and mulched some others, while some we’ve left as stacks of logs. “Our ultimate aim is to open the area up to our staff and members of the public as an area where people can go for a relaxing walk. “There are thousands of people working on the estate and I am sure they would welcome somewhere to go during their lunch break instead of doing a circuit around the main road. The nature reserve project is part of the company’s Village Green campaign to make the family-run business as environmentally sustainable as possible. They have also installed more than 1,000 roof-top solar panels. The 250 kilowatt system means in summer they are able to run their bakery just on solar energy during the majority of daylight hours. Earlier this year the Village Bakery planted the verges and grassed areas around its two bakeries on Wrexham Industrial Estate with wildflower seeds. According to the company, the newly-sown wildflowers in the verges will create the idea habitat for the endangered Grizzled Skipper butterflies. The numbers of the butterfly, which has a distinctive chequered black and white pattern on its wings, have halved in Britain over the past 40 years. In addition, they have created a spectacular four storey high living wall of evergreen plants at their new Baking Academy and Innovation Centre which was officially opened by the Prince of Wales and the Duchess of Cornwall . The building’s ground-breaking design includes a host of other green features including rainwater harvesting, massive levels of insulation and building panels made of recycled material. The living wall – believed to be the biggest of its type in Wales – has been planted with hundreds of plants which change colour as the seasons come and go. Mr Jones added: “Business has a responsibility to the environment to do our duty and set something aside for these purposes because otherwise the whole area will be covered in concrete. “We want to show that it is possible for business to live in harmony with nature, for the benefit of both. “We have a track record of investing in the environment. It’s part of our DNA as a company thanks to our chairman, Alan Jones, who has been a champion of the countryside for years. “As a company, the Village Bakery has had an environmental policy for a long, long time, long before it became a requirement.